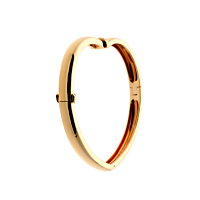 Feminine and fun, this delicate rose gold bangle by Piaget offers a lovely variation on a popular style. This narrow heart shaped band opens on a hinge. A high polish finish gives this bracelet a beautiful gleam, while small pave set round brilliant cut diamonds add sparkle to this piece. While this bracelet has all the beauty of a formal wear accessory, its simplicity makes it a perfect choice for everyday wear. Whether you're adding to your own collection or looking for a unique gift, this bangle has a classic appeal with a stylish design that stands apart. 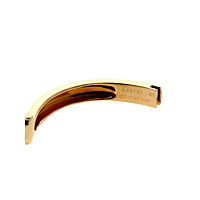 This designer bracelet will fast become your favorite accessory.